At the risk of sounding obsessed, while I have been running less, I have been reading more about running. 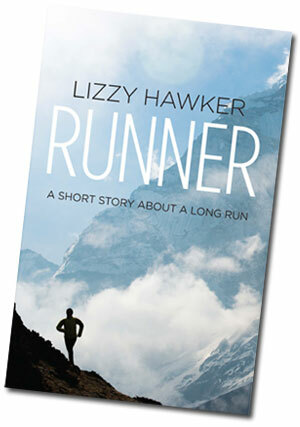 Lizzy Hawker is the most incredible athlete who is hardly known outside the world of ultrarunning. She has competed in the Ultra Trail du Mont Blanc six times, a race of over 150km up, down and around Mont Blanc, winning it five times and coming second once. She held the world record for distance covered in 24 hours in 2011, and won gold at the 100km world championships in 2006. Her book Runner tells the story of these runs, as well as the incredible runs she has done from Everest Base Camp to Kathmandu. It’s a fascinating insight into her love of mountains, running and solitude and the strength of character that enables her to keep on running. I expected to be inspired by her story, to feel envious of the running she’s done, to have my dream of doing an ultra ‘one day’ renewed, but I wasn’t expecting it to be relevant to where I am at the moment. The third section of the book is about the injuries that she has been wrestling with more recently – six stress fractures, one after the other, over the course of two years. Just as she recovers from one and plans her next race, she gets another and is forced to rest. She writes about the challenge this is to her sense of identity, the need to yield to the ways things are rather than resisting, and the importance of dancing on the right side of the line between strength and vulnerability. Here are some of her words that particularly resonated with me. I’m not claiming that I am like Lizzy Hawker in any way other than sharing that love of running, but her words have made me think and helped me see again the opportunity in this season of my life to learn and grow. You don’t become a saint when you have cancer; well, I haven’t. All my insecurities and weaknesses are still present, and often magnified by the things I’m facing. I think many of us, when life is going well, look at the tough times that other people are going through and wonder how we would cope if we had to face the same. This is the year I’ve had to discover how I cope with having cancer, but I don’t think I’ll fully know the answer to that until it is all over one way or another. None of us would choose something like this and I don’t want to romanticise it in any way at all because it’s horrible – not only for me but those who love me, but it has made me appreciate things that I have taken for granted for far too long – my family, my friends, my faith, my freedom. While she’s been injured, Lizzy has been involved in organising the inaugural Ultra Tour Monte Rosa in Switzerland and Italy which starts on Thursday this week. All the best to all the runners!